South Korea Based Samsung Group is a well-known smartphone manufacturer in the entire world and is preparing for its next major launch on 20th Feb 2019. Samsung is expected to launch its S10 line early this year. The S10 has been famous now for various leak rumours now and there has been another one among them. Although the truth behind the matter is still unknown. 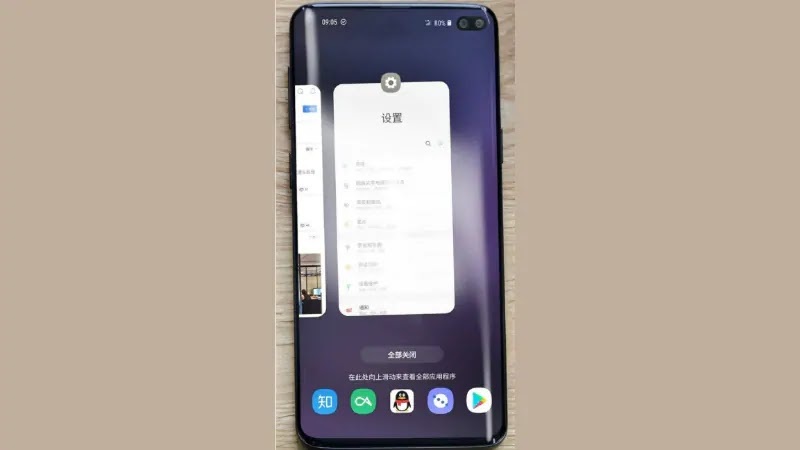 The leak this time is showing off the Galaxy S10+ premium variant and it hasn’t been long since it has surfaced online. In the leaks the smartphone can be seen in the working condition and boasts its infinity display with dual front camera cut-outs in the front. According to the statement made by Mobile Chief DJ "I will try my best to meet the expectations of consumers who have been waiting for our products,” on the topic of Samsung Galaxy S10 and Foldable Smartphones. Although it is not entirely sure whether what reports are suggesting are true or not but, the foldable Smartphones are also supposed to be launched alongside Samsung Galaxy S10 line-up. The Samsung Galaxy S10 line-up will have three variants i.e. Samsung galaxy S10 Lite (or 10E or Just Galaxy S10), a 6.1-inch Samsung Galaxy S10, and a Samsung Galaxy S10+ as the premium variant. The rumours and reports also suggest that there will be a separate variant for 5G support. The date of Feb 20 this year is a very big day for the fans of Samsung smartphone fans as that day is full of announcements from Samsung.